Has its moments, but difficult to recommend. t can be hard to break ground in a genre that's been so unmercifully flooded over the past decade. While there have been a number of gems that, in some way or another, have managed to expand upon what we've come to expect from the medieval RPG, most entries float between the boundaries of mediocrity — satisfying those who crave the traditional adventure romp, but never reaching mass appeal. Enter Divinity II: Ego Draconis, a game that is riddled with far too many issues to be considered remarkable. 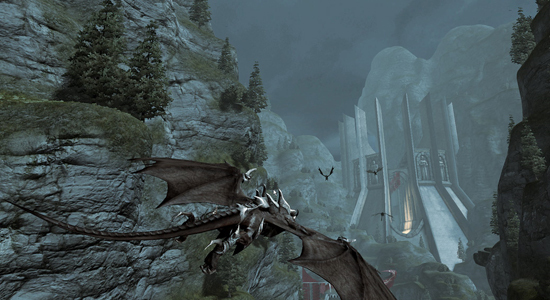 One thing done right: morphing into a dragon is one of the game's few satisfying moments.After the creation of your character (which is extremely limited) the same general progression formula that has dominated most RPGs takes over — that is, complete story quests, complete side-quests, level up, assign attribute points, discover new skills, and complete more quests. While there's technically nothing outwardly wrong with this approach, suffice to say it's very by-the-book. Both melee and ranged combat feel uninspired, mostly due to the bland visual cues that accompany each ability. Targeting is cumbersome when facing multiple enemies, which adds frustration to already difficult encounters (side-quests are made nearly mandatory at points due to the difficulty of creatures you'll encounter if you progress too quickly). From the outset, Ego Draconis can at best be described as clunky. Though the environments are appealing, sporadic frame rates plague nearly all locations. Character visuals and animations appear dated, and certainly not up to the level we've come to expect from this generation of games. The entire game is marred by bugs that vary from enemies being caught behind rocks and trees to entire objects disappearing from sight. Now, from what I've read, many of these bugs apply solely to the Xbox 360 version of the game, which is all too often an unfortunate consequence of porting from the PC. Nevertheless, the sheer frequency at which these errors occur greatly interferes with one's enjoyment. The auditory construction may be one of the title's few redeeming sensory qualities, with a flowing score and, for the most part, solid voice acting. Putting it all together, however, does not yield as immersive an experience as one requires to be truly sucked in. By-the-book: both melee and ranged combat feel uninspired.While it may seem like a mess, not all is lost in Ego Draconis. As one of the game's most touted features, morphing into a dragon is one of the game's few satisfying moments. The freedom at which you can explore the environment is a nice change from recent RPG releases. Mind-reading, one of the games smaller innovations, allows players to delve deep into the thoughts of others, occasionally opening up new quests or access to other locations at the cost of a few experience points. In reality we've seen this concept employed before with persuasion abilities, but I can appreciate what developers were going for. One final highlight involves unlocking the Battle Tower, which grants access companion creation, equipment enchantment, and alchemy, among other things. The creature creator allows you to form an ally (from a variety of parts) that can be summoned in battle. What's nice about this added customization is that it allows you construct something that suits your style of combat. Even though Divinity II: Ego Draconis has its moments, it's difficult to recommend — especially on the Xbox 360. The technical issues contribute largely the game's downfall, but at the very least, some of the more interesting concepts can (and should) be explored in the future.